The Red Thumb Campaign, launched today, is a Road Safety campaign to help raise awareness about the risks of distracted driving – especially when using a mobile phone. The campaign involves a number of local and national organisations including Devon County Council, Torbay Council, Devon & Somerset Fire & Rescue and the Highways Agency. Devon’s road users may also spot the campaign’s message – “What colour is your thumb” on electronic road signs around the county. 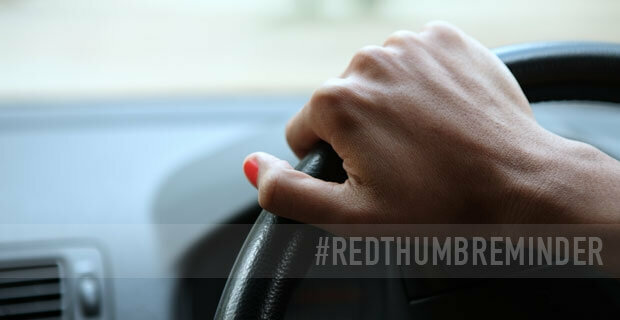 The original idea for the red thumb reminder campaign was introduced in the USA, with a driver painting his thumb nail red to remind him not to use his phone whilst driving. Every time he saw his red thumb he was reminded of the message. Want to understand more about how distractions can affect your driving? Why not take the THINK! driving challenge. Click the image below. The easiest way to get involved is to visit www.myredthumb.com and share anything you find interesting on Social Media. If you live in Devon you can also support the campaign at the Devon County Show from 22 – 24 May 2014.